The postal history of China is centuries old, but in our times; the postal history begins in the late 19th century. In 1865 Robert Hart, an Englishman developed a postal service for the Imperial Maritime Customs and the service was opened for the public on 1 May 1878. The first Chinese stamp known as the Large Dragon series was issued the same year. The stamps were inscribed "CHINA" in both Latin and Chinese characters, and denominated in Candareens. Initially, all mail to foreign destinations went through Shanghai, but by 1882 there were twelve post offices. On 20 March 1896, an edict directed that the Customs Post become the Imperial Postal Service effective 1 January 1897; the Min Hsin Chu was shut down, as well as the Shanghai local post, and postal system adopted cents and dollars as the units of currency. The left stamp on the top line above is one such stamp that was issued in 1885, with a face value of one Candareen. The centre stamp of half cent value was issued in 1897. The stamp on the left was issued with an overprint on a 30c imperial stamp with a postmark of “HANGCHOW.” This stamp was issued after the 1911 revolution and making of the Republic of China. The first commemorative stamps of China were issued in 1909 to mark the 1st year of the reign of the Xuantong Emperor. The set of three (2c, 3c, 7c), with photo of the Temple of Heaven in Beijing. 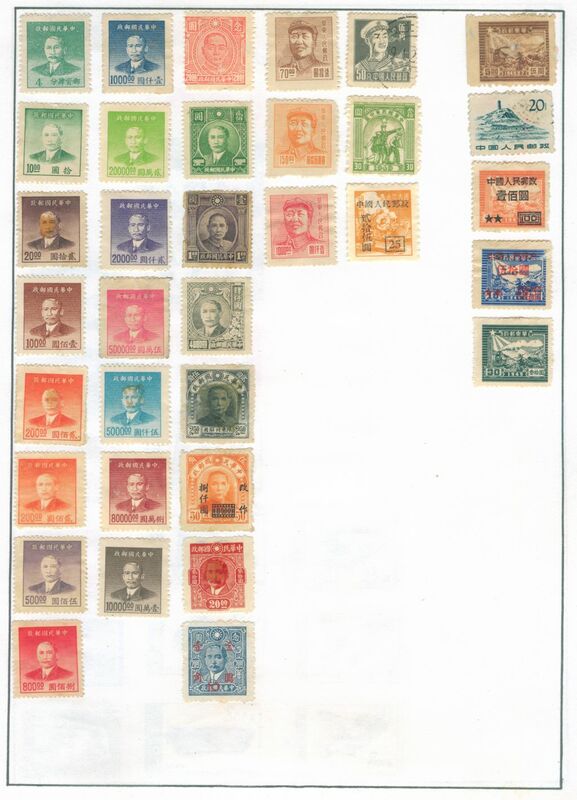 Coming to my collection of stamps, the stamp on the left in the bottom line above shows a part of the definitive series issued in 1931 depicting Sun Yat Sen. The stamp in the center is from the post World War-II era when China was under Japanese occupation. This stamp was issued in 1946. The stamp on the right in the bottom line was issued in 1949 of $1000 value. A page from my stamp album can now be correlated with the stamps I mentioned earlier and it can be seen that I have stamps of China darting as far back as 1931. After the Communist Revolution, stamps with head of Mao Tse Tung were printed and issued for a long time, some in the fourth column from my collection.